The best. 4 LP + 2 HP ports. Balanced diaphragm 1st stage. DIN/ACLAMP Simplicity is the best approach for reliability. Refer to Mares web site for the phenomenal achievements of this regulator. The ATX40 has all the high performance features; DS4 - Dry sealed system for cold water - No turret - 4 medium pressure ports 3/8 UNF - 1 high pressure port 7/16 UNF. 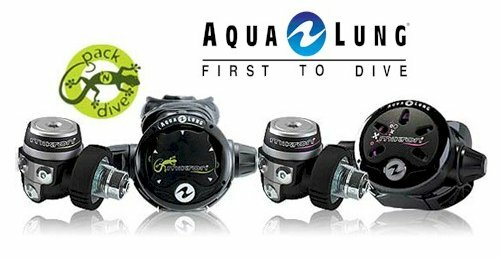 Aqua Lung has once again raised the bar on regulator design with the release of Mikron - the smallest and lightest weight regulator in the line. Weighing in at just 26 oz. (din) and 31 oz. (yoke), the travelling diver will benefit tremendously. Even more amazing is that performance is not sacrificed by the extreme compactness of the regulator. Its balanced first and second stages produce exceptional breathing performance. 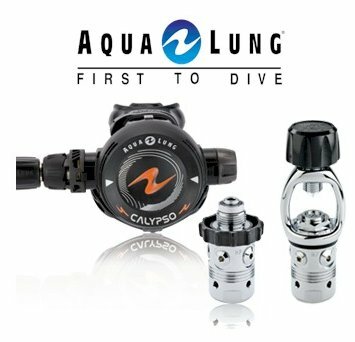 The Calypso series first stage features a in-line high flow Piston design to provide the diver with the best combination of simplicity, performance & value *Compatible with EAN 40 right out of the box. High-flow, in-line piston first stage design produces very stable pressure to the second stage. High-performance, mid-sized second stage. 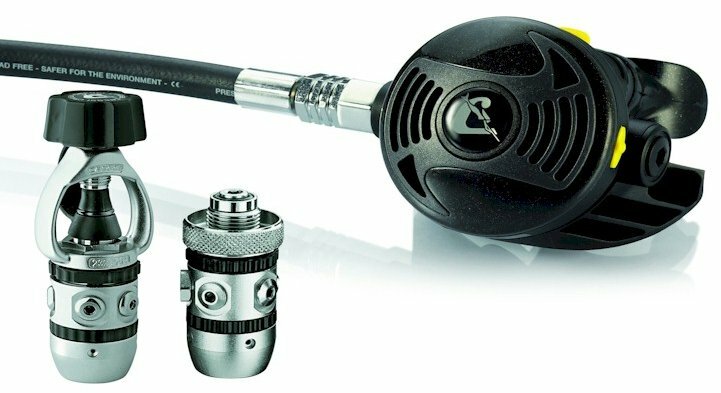 Large diver-controlled Venturi Adjustment Switch (VAS) reduces sensitivity to free flow on the surface and provides maximum airflow at depth. 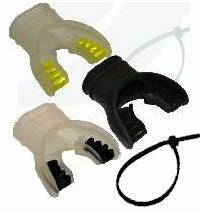 Equipped with Aqua Lung's exclusive Comfo-BiteTM mouthpiece. Dismantling & maintenance are quick and easy thanks to the new INT yoke connection system or the internally threaded DIN fitting. Hyper-balanced diaphragm first stage. 3 pre-oriented low pressure outlets. 1 high pressure outlet. Sintered filter with greater surface area. First stage completely protected by an elastomer shell. Available with INT yoke or with DIN 200/300 bar fitting. Weight of MC5 with INT yoke: 550g. Weight of MCR with DIN 300 bar fitting: 450g. XS2/AC2 is the cheapest regulator in the Cressi range. 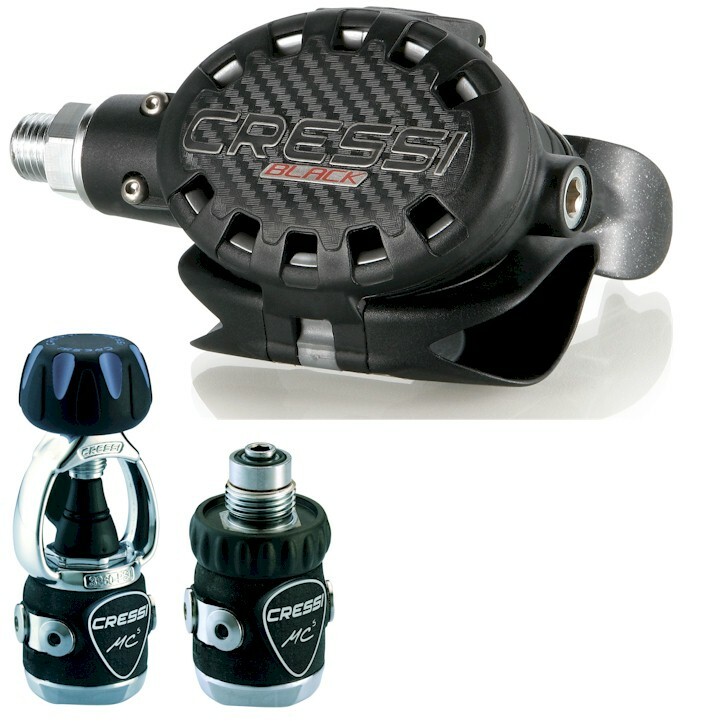 The XS2 2nd stage comes with the traditional Cressi AC2 piston 1st stage. 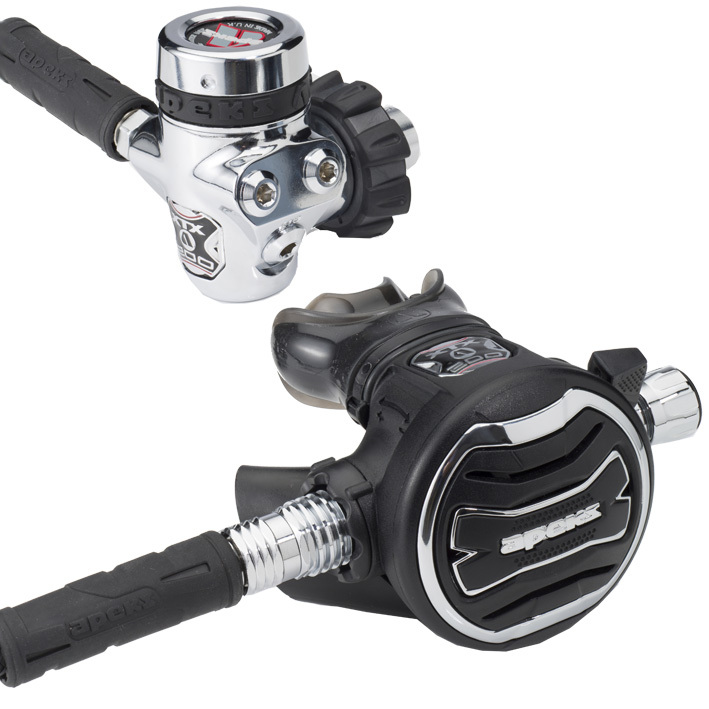 XS2 comes with the traditional Cressi AC2 piston model. This is a non-balanced first stage with such high performance that it can be compared to lots of excellent balanced models. Available 200 bar A-clamp or 300 bar DIN. 4 LP + 1 HP ports. TOP PERFORMING BUDGET REGULATOR - Performance, reliability and simplicity. Unfailing reliability over time. Oversized purge button, Ideal for Diving Centres. Piston Semi Balanced 1st stage, 4 LP &1 HP ports. The Apeks Flagship regulator. 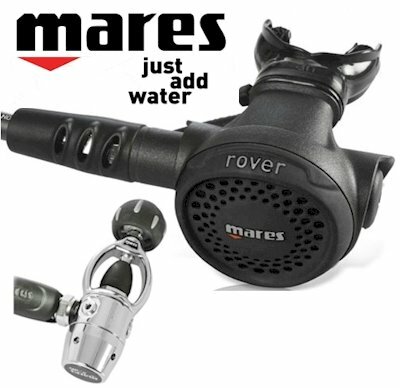 Features the Auxiliary Emergency Breathing System & the new European Standard. 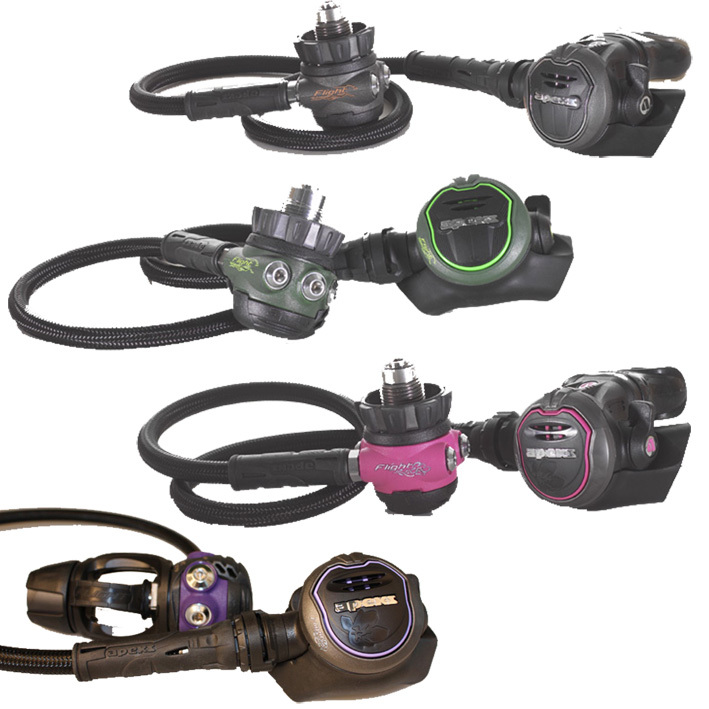 The new XTX regulators are the first in the world to meet this major Safety Standard. 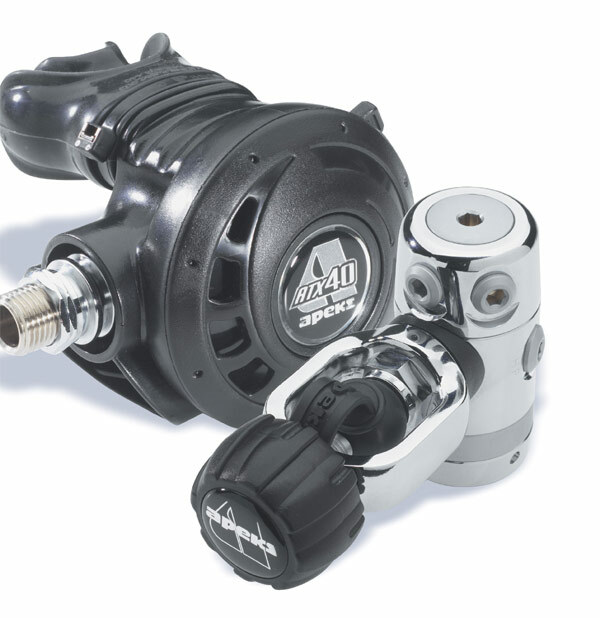 The XTX200 can be converted from a right handed hose configuration (as supplied from the APEKS factory) to a left handed one. 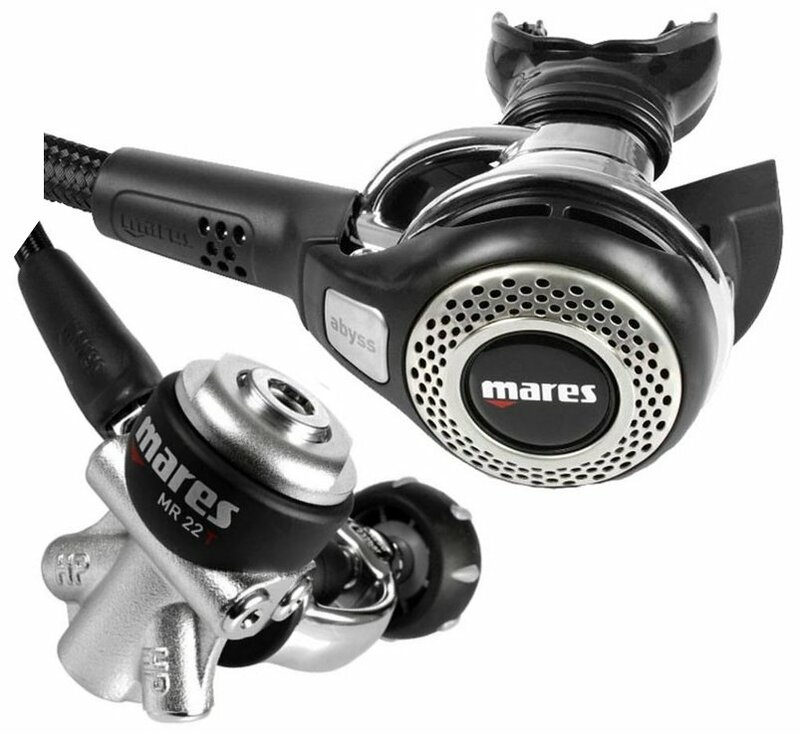 Also The 2nd stage of the XTX200 features the Diver Changeable Exhaust System (DCE) giving divers the ability to change from a small to a large exhaust. Environmentally dry sealed system with 4LP & 2 HP ports DIN or A clamp. 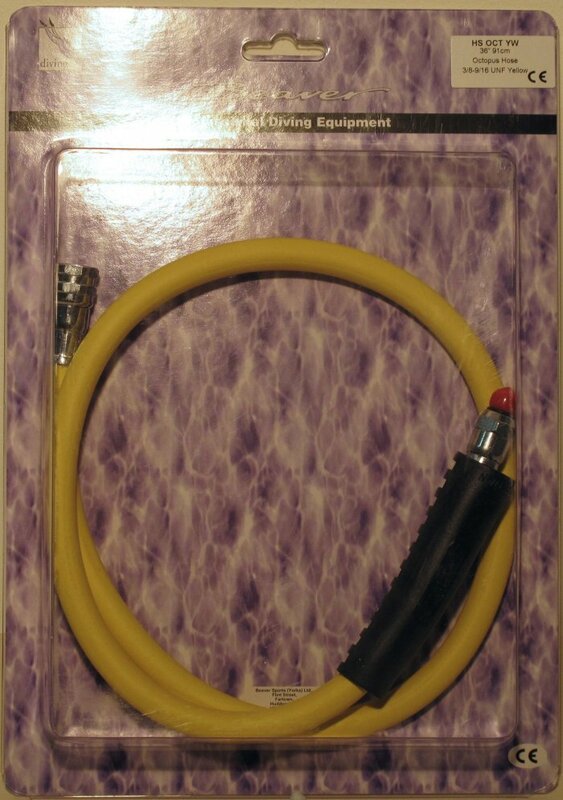 BRAIDED Regulator hose: Available in BLACK or YELLOW - With fitted braided hose protector for extended durability. BRAIDED Octopus hoses. 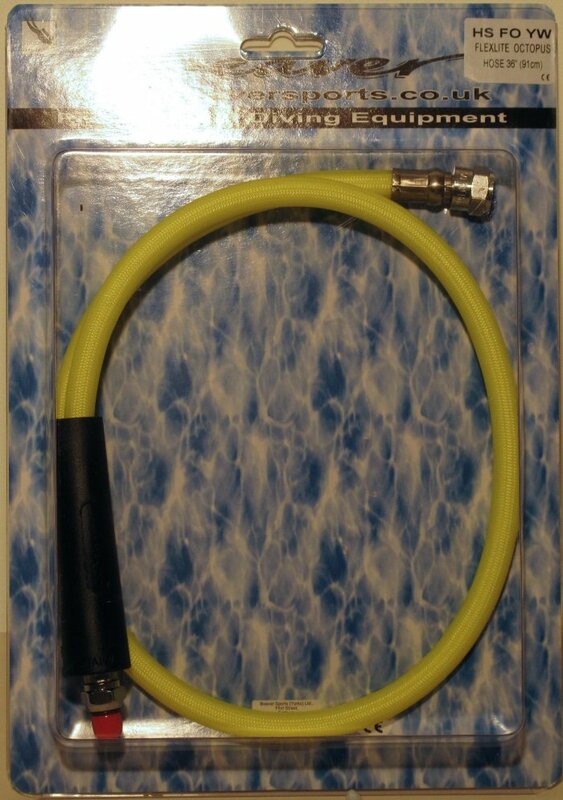 Available in BLACK or YELLOW - With fitted braided hose protector for extended durability. 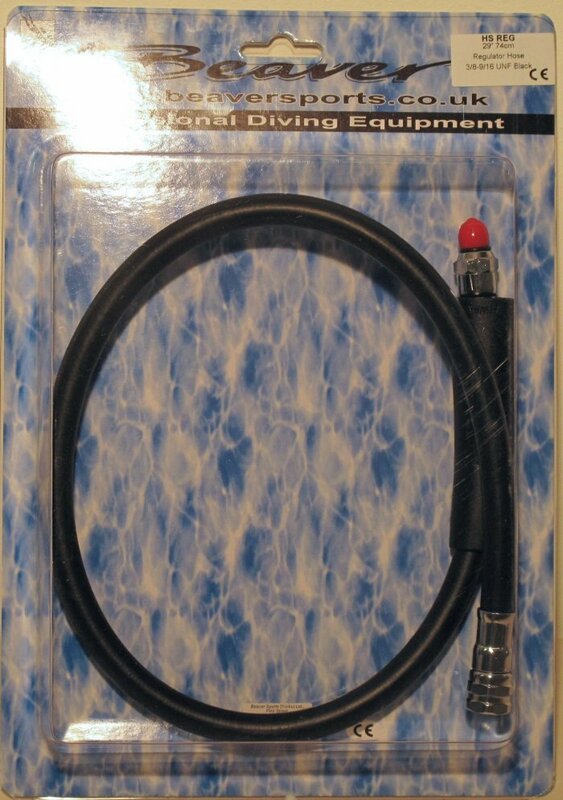 BRAIDED BCD hose. Available in BLACK. 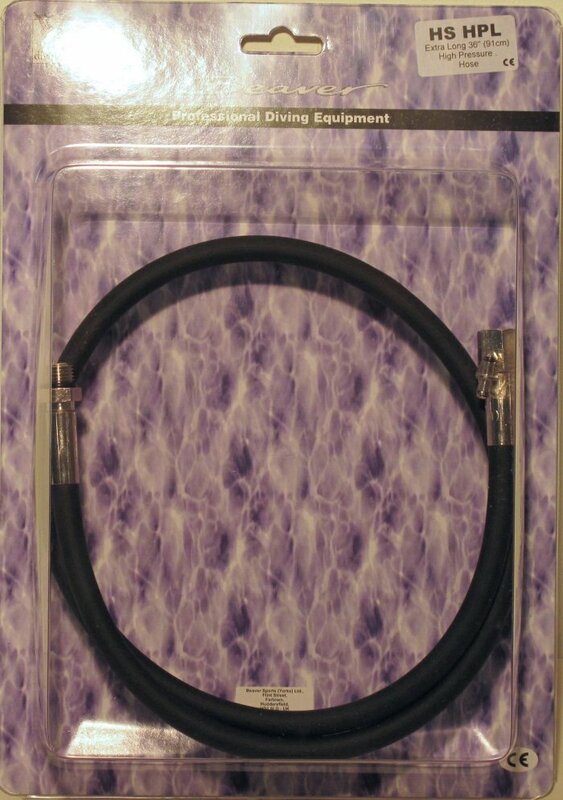 With fitted braided hose protector for extended durability. Quick release hose for use with most BCD Inflators, with 3/8" UNF male thread & standard 9/16" QD fitting. Available in black or yellow. For use with most types of octopus or regulator, with male 3/8" UNF & female 9/16" UNF swivel fittings. Hose protector supplied fitted to extend durability. STANDARD Regulator hoses. Available in black or yellow. 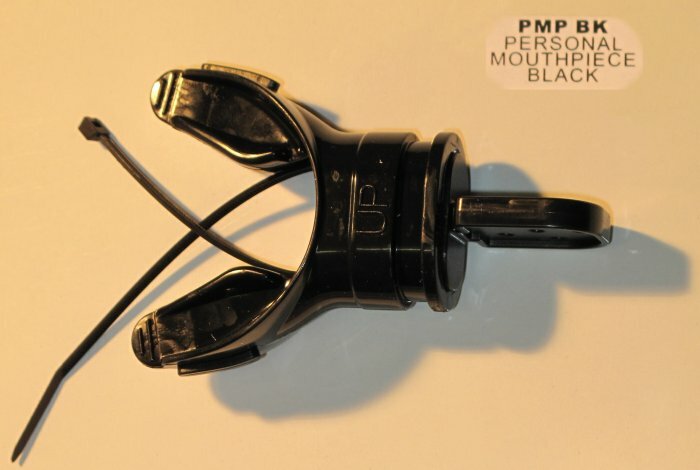 For use with most types of octopus or regulator, with male 3/8" UNF & female 9/16" UNF swivel fittings. Hose protector supplied fitted to extend durability. For use with most types of pressure gauges & consoles, with male 7/16" UNF & female 7/16" UNF swivel pin fittings. 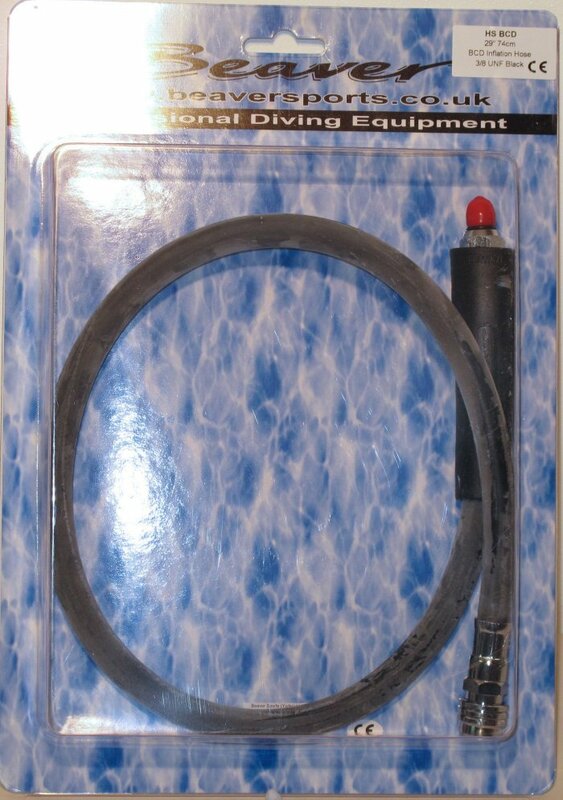 STANDARD Octopus hoses. Available in BLACK or YELLOW (shown). For use with most types of octopus or regulator, with male 3/8" UNF & female 9/16" UNF swivel fittings. Hose protector supplied fitted to extend durability. 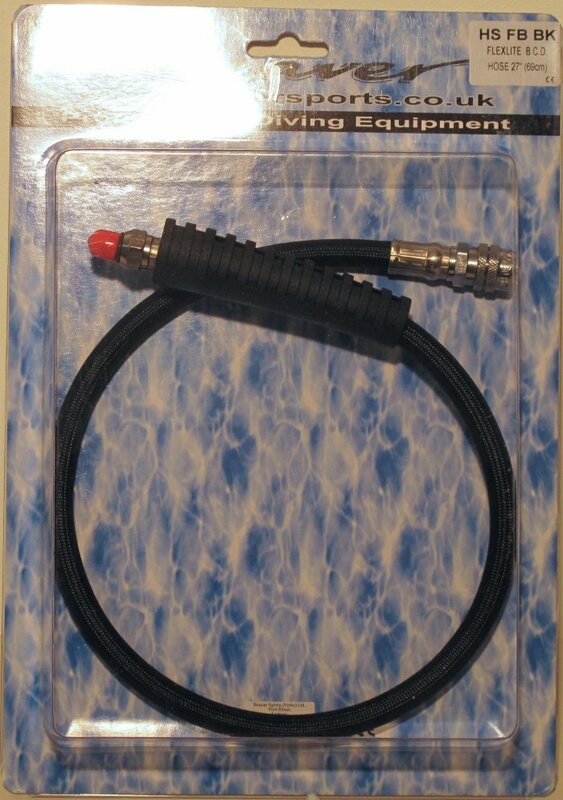 Quick release hoses for use with most BCD Inflators, with 3/8" UNF male thread & standard 9/16� QD fitting. With fitted hose protector for extended durability. Crystal silicone, ergonomic design for extreme comfort. 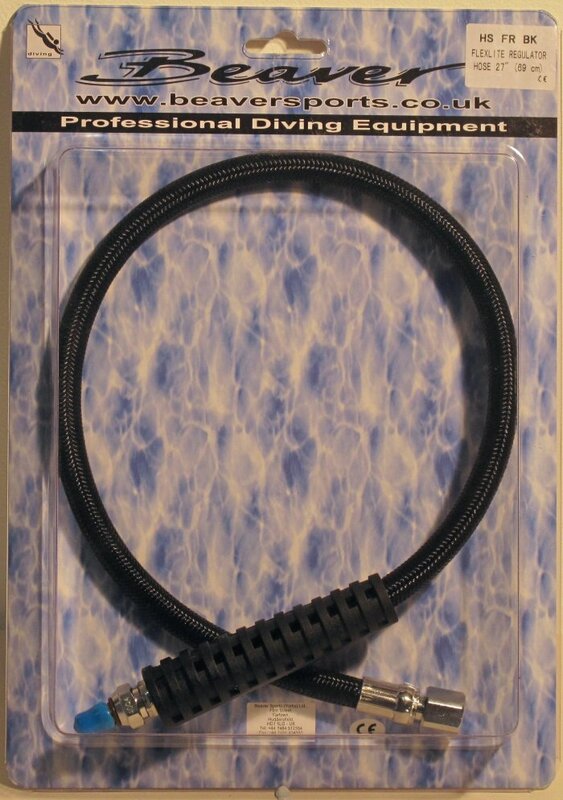 Fits most regulators & snorkels with separate mouthpieces, supplied with convenient tie wrap fastener included for immediate use.Available in black or clear. 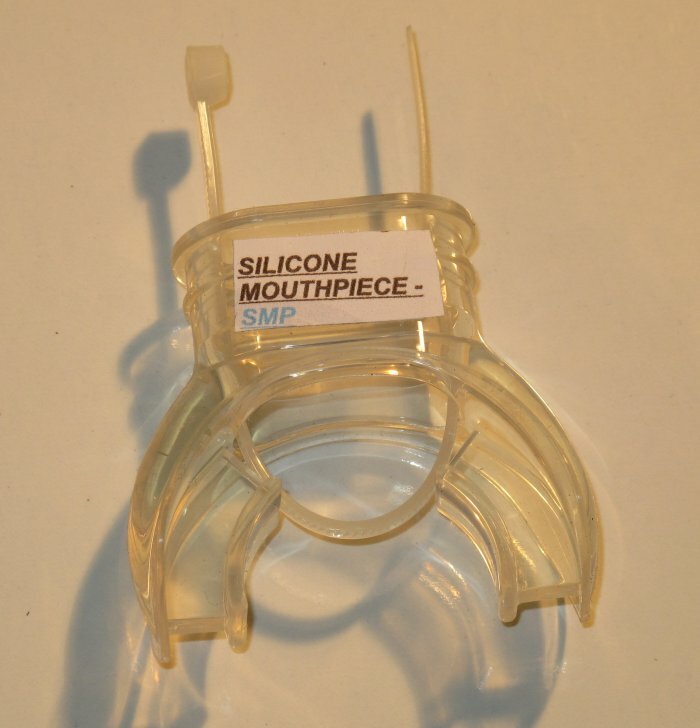 Clear hypo-allergenic silicone, fits most regulators & snorkels with separate mouthpieces. With convenient tie wrap securing fastener. 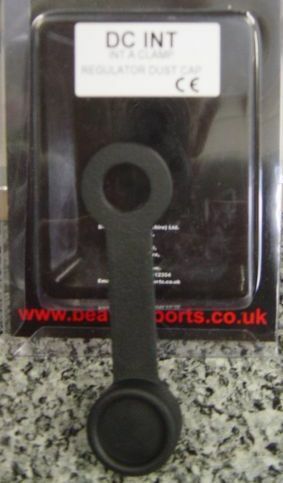 For extra grip and security, available in clear or black long life silicone, ergonomically shaped & fits most regulators & snorkels with separate mouthpieces. Tie wrap fastening included. Dual material mouthpiece giving you the comfort of a silicone body with the durability of a tough bite flange. 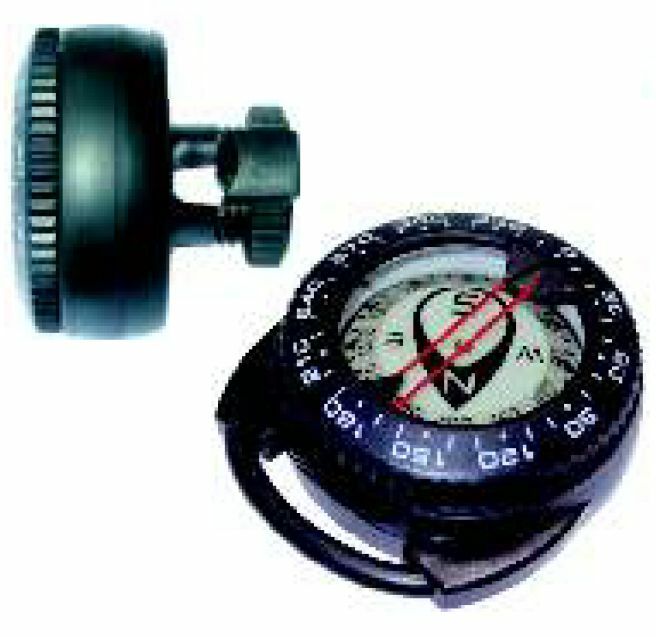 Available in clear or black long life silicone, ergonomically shaped & fits most regulators & snorkels with separate mouthpieces. Tie wrap fastening included. Available in clear/black or clear/yellow, or black. 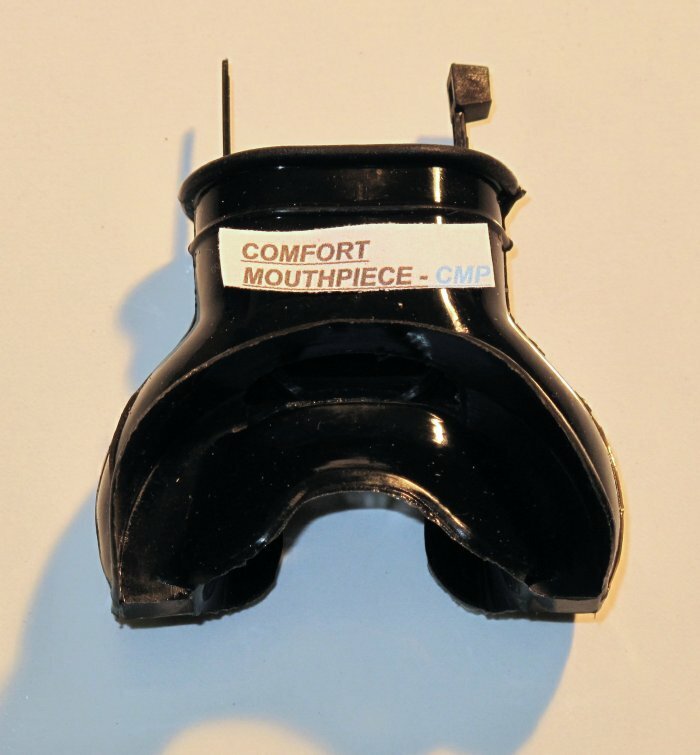 Custom mouldable for the individual this mouthpiece made from a specially formulated material provides the ultimate in comfort and fatigue reduction while using a regulator. 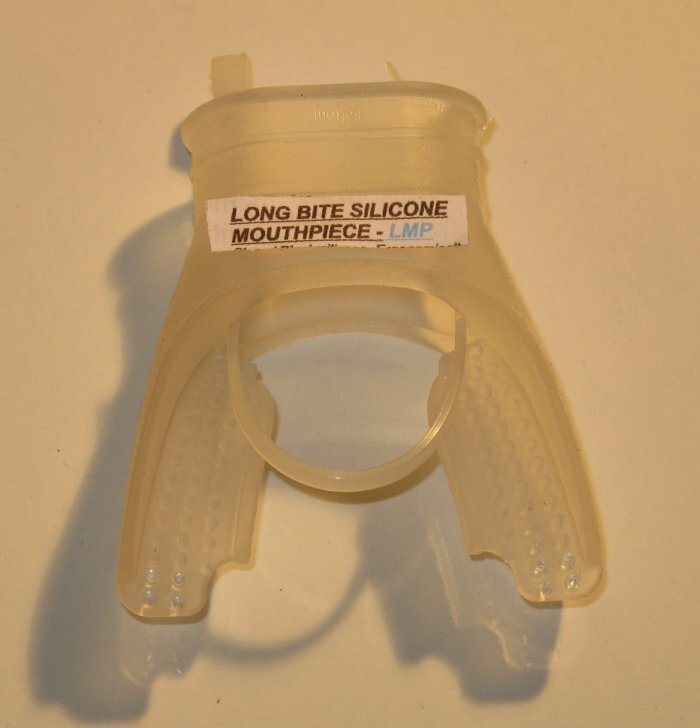 Simply heat the mouthpiece in hot water and bite down to create your own personally fitted long bite regulator or snorkel mouthpiece. Available in black or clear. Ensure your expensive regulator is protected. Please make sure you specify the correct Product Code & required quantity. In order for us to accurately calculate shipping costs, please include your full postal address. 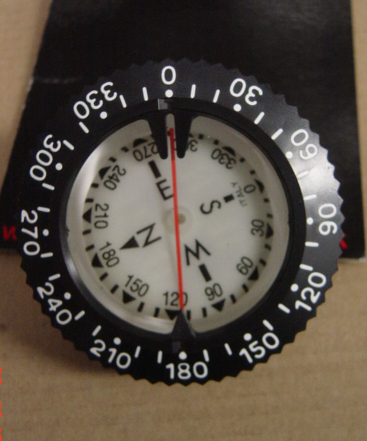 We will check stock & get back to you directly with a total price and our banking details. See our Full Terms & Conditions for details.